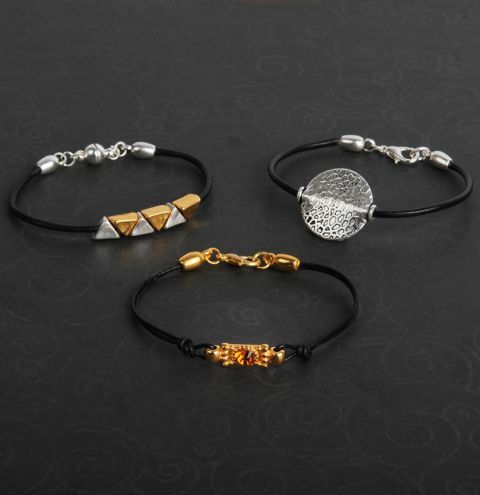 Learn how to make a simple but glamorous set of bracelets with gold and silver metal beads! Cut a length of leather 1 inch less than the measurement of your wrist and snip the ends to a sharp point with a pair of scissors. Slide on the triangle beads, alternating between gold and silver and turn them to fit next to each other. If you prefer your beads to stay in place, apply a very small amount of Fevi Kwik glue in the position when the end beads will sit and move the bead into position oner the glue. Once dry, glue each end of the leather into the caps. Attach a jumpring to each cap and add the lobster clasp to each side. Cut two lengths of 1mm leather cord of approx. 6 inches. Thread each leather cord through a loop on the metal connector to the half way point. Tie both pairs of cords in a knot. Measure the bracelet against your wrist and take into account the length of your clasp. Trim any exess leather if required. Snip the ends to a point and glue them into the cord ends. Attach a jumpring to each cord end and a lobster clasp to one of the sides. Glue the crystal into the setting with Gem-Tac and allow to dry before wearing your bracelet. Cut a length of leather approx. 1 inch shorter than your wrist size. Snip the ends to a sharp point. Slide on the metal bead and glue each end of leather into a cord end. Attach a jumpring to each cord ends and finish by adding your lobster clasp and jumpring.